There can’t be many airports in the world where they sell you canisters of oxygen in the arrivals lounge but then at almost 13,500 feet above sea level flying into Bolivia’s El Alto international airport was never going to be a straight forward experience. As we descend to the runway below, our bird’s eye view reveals a sprawling city of tin, brick and adobe. Originally a shanty town thrown up on the outskirts of La Paz, El Alto perches high in the thin air of the altiplano – the vast high plain that lies between the Andes’ two great mountain chains. Hurtling down the autopista from the airport to the more oxygenated climes of La Paz’s Zona Sur and our hotel below, we take in a city that appears to cling for dear life to the mountainside, barrios linked by an awesome system of cable cars and everything dwarfed by the snowy jagged peaks of Mount Illimani to the city’s south. It’s been many years since I was last in Bolivia (then working as a journalist based in La Paz and although drinking an awful lot of coffee not yet roasting it) but the city has always remained one of my most beloved places in the world. A fantastic mix of modern and traditional, La Paz embodies South America at its craziest and wildest best. Businessmen in suits rub shoulders with Aymara cholitas in their colourful pollera skirts and bowler hats. Stray dogs are fed by locals and lovingly dressed in T-shirts to combat infamous altiplano chill. The witches’ market offers charms and amulets for sale while brightly painted colectivos lurch up city’s impossibly steep streets belching out a cacophony of diesel fumes and cumbia. Bolivia was also the country that also first fired my passion for coffee. Writing a story on Bolivian coffee production back in the late 1990s, I found myself accompanying a green buyer careering down ‘the world’s most dangerous road’ from La Paz to the coffee lands of Caranavi with a suitcase of dollars on the backseat of our Landcruiser and a revolver in the glove compartment. 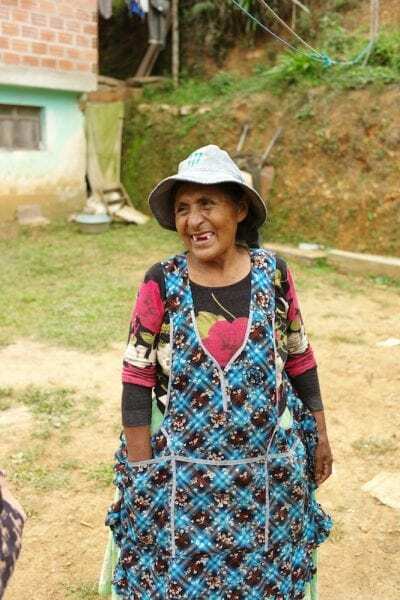 Suffice to say things are a little different these days not least thanks to the amazing work being done in the world of Bolivian speciality by the Rodriguez family of Agricafe Bolivia. We meet Daniela Rodriguez at the company’s dry mill in La Paz. Nicknamed La Luna, for the fantastic lunar landscape that it sits in with views straight across the valley to Illlimani and beyond, the mill is an impressive warehouse storing brightly coloured bags of green coffee for export, hulling and sorting machinery as well as a state of the art cupping lab where we were treated to a table of some outstanding coffees. Cupping at high altitudes has its challenges – at 12,500 ft above sea level (the altitude of La Luna) water boils at a paltry 87 C and you can start slurping within 5 minutes with no risk of scorching your taste buds. Bolivian coffee has always been a favourite of ours at Glen Lyon. Obviously we may be a little biased considering our undying love of the country but the coffee grown here really is very special indeed. The country’s brilliant climactic conditions produce some stellar microlots (as you’ve probably gathered by now there’s no shortage of altitude in this part of the world) and the best Bolivians are full of delicious notes of apricot, grape and summer berries. It’s not really surprising that it was one of Agricafe’ coffees – a beautiful geisha lot from Finca Las Alasitas – that won Japan’s Miki Suzuki second place in last year’s World Barista Championships in Seoul. Bolivian speciality demands a high price and deservedly so. National output is tiny -accounting for less than 1 % of the world’s production. To put that into perspective some of the largest Brazilian fazendas can produce more coffee in a season than Bolivia’s entire national annual output. And things remain tenuous for coffee production in the country. In 2011, the year we started roasting coffee in Glen Lyon, Bolivia exported around 70,000 bags. By 2016 this was down to just 22,000 bags. Getting coffee out of the country can also be something of a logistical challenge. Back in the 1880s Bolivia lost its coastline to Chile in the disastrous War of the Pacific and since then exports have to travel out of the country via the Chilean port of Arica. 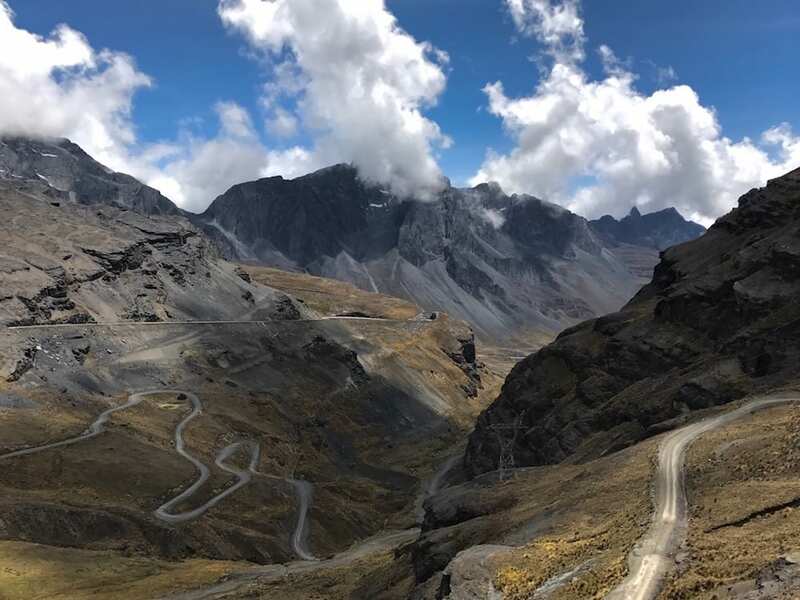 One thing that has improved in recent years is the infamous ‘Death Road’ that connects La Paz to Caranavi. Most of the terrifying switchbacks which back in the day would see weekly fatalities have been bypassed and nearly 75% is now asphalted. Still, it remains a pretty hair-raising drive and we made sure that we stuck to the tradition of pulling over at the top of the cumbre to placate pachamama and the mountain spirits with coca leaves and liberal quantities of alcohol sprinkled onto the roadside to ensure us safe travels. Thanks to the remarkable skills of Milton, our lovely Aymara driver, we pulled into Caranavi unscathed. It was coming up to the end of the harvest but Agricafe’s Buenavista mill was still humming with activity when we arrived. As well as their own farms, Agricafe work with and buy coffee from a number of other small producers in the area. The mechanical drier was at full steam and as dusk fell trucks of freshly hand-picked coffee cherries started pulling in to the mill. The sacks of cherries were weighed then poured into the de-pulpers before entering the tiled fermentation tanks. Outside raised tables were laden with drying naturals. 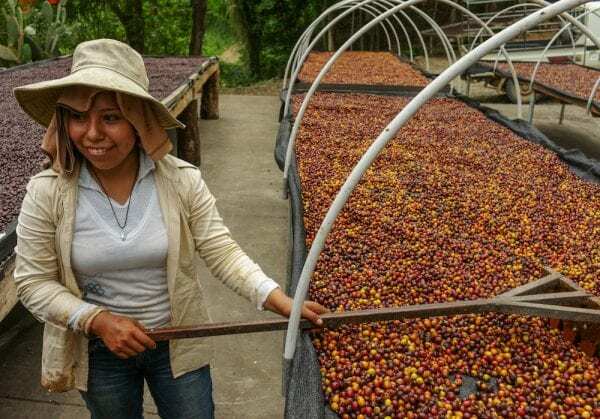 Daniela’s brother Pedro Pablo was deep in meetings with producers and the air was thick with the scent of blossom, fermenting coffee and the buzz of insects. Talk was full of the upcoming football game that evening between the mill workers and the coffee producers. Later we sat on wooden benches round an old community concrete pitch in town to watch the match. Coffee farming must keep you fit: the producers thrashed the mill workers. Next up it was the ladies’ turn and I was roped in to play on the mill’s side. The farmers’ wives whisked off their polleras to reveal football shorts, shin guards, flying pigtails and awesome footy skills. I was left completely out-manoeuvred, out of breath (I blame the altitude!) and seriously impressed. 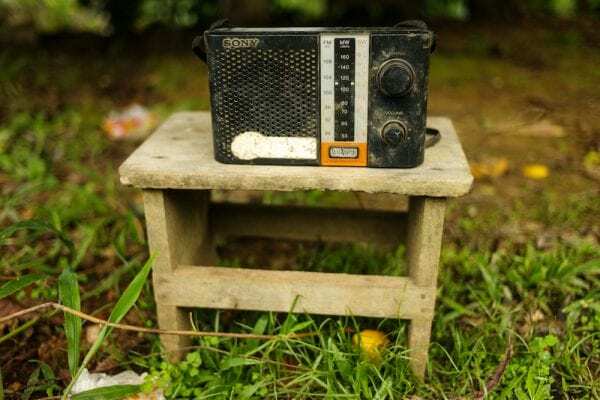 It’s obvious that Agricafe have an amazing relationship with the farmers that they work with and this becomes even more apparent when we head up to the colonias above town the following morning and meet the farmers. The Rodriguez family are doing phenomenal work with their Sol de Mañana programme, set up some years ago, the programme provides education and training in best agricultural practices to help producers improve both quality and yield. Beautiful Bolivia – it was more than amazing to be back after all these years and a real honour to spend time with such enlightened and dynamic people who are ultimately ensuring a future for Bolivian coffee production.